We do the right thing at the right time, every time! 24/7 365 days a year! Patriot HVAC Services, Inc. is family owned and operated company built on the foundation of providing exceptional customer service while doing the right thing at the right time, every time! Our goal is to exceed expectations and to be available 24/7/365 to provide the needed HVAC services to your family. Our Patriot HVAC family of workers has agreed on the importance of honest hard work, exceptional client service, and most importantly, helping others. Our desire to create a business that reflected these values lead them to start Patriot HVAC. 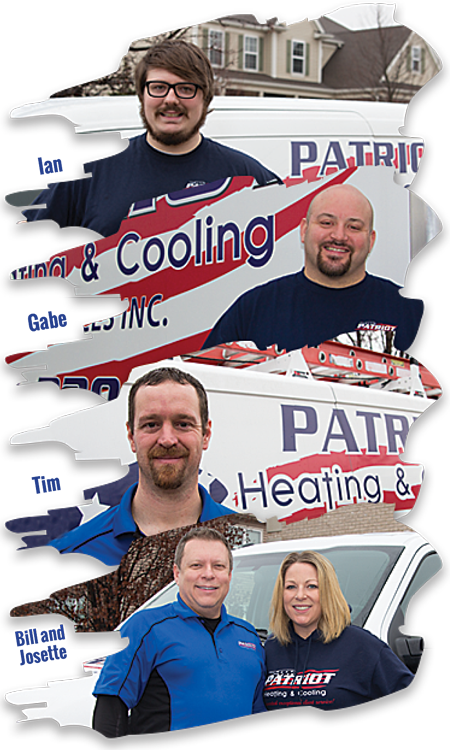 Why Choose Patriot Heating & Cooling Servies, Inc? We know that you have thousands of options for HVAC service, repair and replacement. With a combined experience of over 35 years and a client-centered vision of service, honesty and integrity, we know you can count on our exceptional technical know-how and customer service. We are very proud of our long lasting relationships with our clients and look forward to working with you and your family. All of our Furnace, Air Conditioning and HVAC repairs and maintenance come with our standard 100% money back satisfaction guarantee! If you are not satisfied let us know and we’ll do everything we can to make it right. Each of our techs are experts in the HVAC industry, and complete continuing education courses. All techs are background checked and drug tested to guarantee only the best people in your home. It is just part of our family culture! We’re here when you need us! Whether it’s a same day service call, a next day installation or a midnight emergency, we pride ourselves on being available to you and your family, any time or day to help get you back to enjoying your home again. Before any service or install we will always provide you with detailed and comprehensive up front pricing. You’ll know exactly what to expect before any work begins. No Surprises Ever! Warranties differ from repairs to service and from product to product. You can always count on Patriot to provide you with some of the very best warranties in the industry. Since his youth Bill has been involved in sales–candy for youth baseball, pizzas for church youth group, Christmas cards and gift wrap for school fundraisers. Later Bill’s talent for serving others through selling lead him to a career in sales and he began to develop the concepts that he would carry forward even to this day. Bill brought these concepts to the HVAC industry and saw immediate success. Bill attended many industry specific training classes, including the prestigious Trane Boot Camp. He continues to train in both technical and sales capacities so the he can deliver exceptional client service. His attention to detail and desire to serve other people sets Bill apart from the rest. As a sales manager Bill spent his time teaching and mentoring others helping them to learn the true benefits of serving others first. Bill has a vision of living a life of significance. It’s not what you get out of life it’s what you give and what you leave behind. That is one reason family is so important to Bill. Bill and Josette have seven children between them, Michael, Joshua, Jacob, Destiny, Faith, Lindsay and Brittany. That’s a total of 9 people, a baseball team! You will see Bill at soccer games, softball games, basketball games or any other kid event that one of the kids happen to be at that day–anywhere from Aurora to Bartlett! In the moments that there are no kid activities Bill and Josette will be drinking wine or entertaining with friends and family. And there will more than likely be chocolate involved.